Kenya’s unique combination of its beach and safari circuit are the pillars of the country’s huge tourist industry, with around 1.5 million people flocking to its 19 game reserves and the 1,400-kilometre Indian Ocean coastline every year. The tourist season is also one of the longest anywhere at 40 weeks a year, with no typhoon season or extreme weather conditions to trouble it—only the rainy season around Easter. At other times during the year, the trade winds that once powered commerce between Africa and India fuel a booming kitesurfing industry on the powder-white beaches. Among them is Diani, which has just been voted one of the best beaches in Africa by TripAdvisor. Its popularity is on the rise again too, with occupancy rates in its beachfront resorts having doubled since 2015. A new bypass road under construction will also provide a direct link to the south coast from the western side of Mombasa city. Kenya’s second home market is largely internal, with demand mainly from wealthy Nairobi families seeking a beachfront holiday home. Whilst house and apartment sales are typical, it is increasingly common for buyers to invest in a beachfront plot and build a holiday home. Overseas interest in Kenyan holiday homes comes mainly from British buyers, but we also see a sizeable number of Italians and other nationalities drawn to the coast around Malindi, Watamu and Lamu, as well as the countryside such as in Nanyuki close to Mount Kenya, and within private game conservancies. Nairobi is a different residential market altogether. 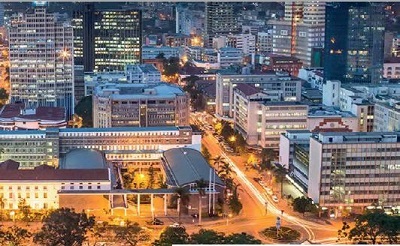 As a fastgrowing melting pot and major regional hub with a strong economy, Nairobi attracts international corporations looking to set up their headquarters in Africa. The biggest employers are those in the FMCG (fast moving consumer goods) sector who are tapping into new wealth and spotting the country’s massive growth potential. The city’s hotel industry is growing fast, as is the technology industry, which attracts many young Americans straight out of college who want to embrace exposure to this rapidly expanding market. While many expatriates will live in high-end residential areas such as Karen, Runda or Muthaiga, these young tech workers tend to rent apartments closer to work and enjoy Nairobi’s burgeoning youth culture in the form of trendy bars and clubs. The Kenyan capital is also on the radar of many high net worth investors, as seen in the Knight Frank Wealth Report 2017. Among the global HNW population, 4% look to own homes in Kenya—led by the UK’s HNW population, 63% of whom express interest in Kenyan property, followed by 16% of South African HNWIs and 11% of Spanish, Mauritian and US HNWIs. About 5% of the super-rich in Uganda, Tanzania, Nigeria, Ghana, Switzerland, France, Canada and Lebanon are also likely to invest in homes in Kenya. The country as a whole is among the top five most popular second home locations for Africa’s wealthiest. New construction of prime residential properties is continuing apace in Nairobi and the abundance of supply ensures availability for those seeking bargains. However, affordability remains an issue for the local market, with much of the new stock beyond the means of most people. The biggest issue is access to credit. In a country of 48 million people, less than 30,000 have mortgages. Interest rates are currently capped at 14.5%—as they would usually be closer to 16%—in a political move to free up mortgages, but the cap slashes the margins for banks. Lenders are tending to put their money into government bonds rather than get involved in the private mortgage market. Many overseas investors will buy with cash or get dollar denominated mortgages at far better rates, but the lack of liquidity in the Kenyan property market is a major obstacle. There is optimism that the market will pick up in 2018, however. Nairobi is a key regional centre that offers good prospects for investors, and Kenya’s relations with its neighbouring countries has never been better. On the coast and in the bush, buyers will be drawn by their hearts as much as their heads—and as history has shown, little will stop them. Thinking of buying in Kenya? Our step-by-step guide takes you through some of the key considerations. The purchaser begins with identifying a suitable property for purchase. One needs to enlist the services of a reputable real estate agency/firm to assist in identifying a suitable property. The buyer then should endeavour to visit the site and satisfy themselves that it meets the desired criteria including its physical location and boundaries, and thereafter make a formal offer or expression of interest. After an offer has been accepted, buyers should conduct due diligence to verify the ownership and other material aspects pertaining to the property and documentation etc. The vendor also conducts due diligence on the buyer. If the due diligence process is successful, both parties then instruct their advocates to proceed to the contract stage. The procedure may vary slightly depending on whether one is buying a completed property (ready for occupation), land or an off-plan property. In the former, after paying the deposit, the transaction is completed within a defined closure period, normally 90 days from date of signing the sale agreement (although parties can mutually agree on any closure period that suits them). In the latter, after paying the requisite deposit, buyers normally pay a percentage of the purchase price in equal instalments until the project is completed. Once the sale agreement is signed by both parties, the deal becomes legally binding and enforceable under the law of contract. The buyer is required to pay a deposit of at least 10% of the purchase price (or such other amount as may be agreed by both parties) upon signing the sale agreement. The deposit is held by the seller’s advocates as stakeholders pending completion of the transaction in accordance with the terms of the sale agreement. Alternatively, the buyer and seller can mutually agree to open a joint escrow account mandating both advocates to oversee the purchase funds until completion of the sale. Buyers will normally then forfeit a percentage, or all, of the deposit if they default or are refunded the said deposit if the seller is unable to complete the transaction. It is important that every instrument effecting a disposition in land is executed by each of the parties consenting to it. Execution under the relevant Kenyan law consists of the person appending his/ her signature or affixing his/ her thumbprint or other mark as evidence of personal acceptance of the instrument. Execution by a corporate body, association or any other organisation should be done in the presence of an Advocate of the High Court of Kenya, a magistrate, a judge or a notary public. On the completion date, buyers are required to pay the full balance of the purchase price in exchange for the completion documents from the seller. Once the buyer’s advocates are in receipt of the completion documents, they make arrangements for the property to be assessed for Stamp Duty by a Government Valuer and subsequently stamping of transfer documents. Thereafter, they proceed to lodge the property for registration in favour of the buyer. After the registration process, the seller’s advocate is legally permitted to release the full proceeds of the sale to the seller. Consequently, the buyer is officially handed over possession of the property and becomes the new legal owner. The certificate of title issued by the Registrar upon registration, or to a purchaser of land upon a Transfer by the seller is taken by all courts as prima facie (at first appearance) evidence that the person named as the proprietor of the land is the absolute and indefeasible owner. It is also possible to purchase land in Kenya without being in the country. One can assign a lawyer to go through the whole process on their behalf through the power of attorney. Buyers will incur certain transactional costs when buying either residential or commercial property in Kenya. Agency fees: The agent is paid by the party who instructs them; either by the seller who instructs the agent to market the property or the buyer who instructs the agent for a property acquisition. The fee is on a scale capped at a maximum of 3% of the property’s value. Registration and disbursement fees: Buyers are generally responsible for the cost of registration of titles in their name(s) together with other disbursement costs as may be advised by the seller’s advocate. Just like Kenyan citizens, foreigners are permitted to buy commercial and residential properties/land located within a town or municipality without any restrictions whatsoever, provided that they comply with the laid down procedures. The only restrictions are on owning agricultural land, freehold titles and first row beach plots along the Kenyan Coast. Article 65 of the Kenyan Constitution limits foreigners to holding only leasehold titles for a maximum of 99 years but permits future renewals on condition that the subject property held under that title is economically active and it is not required for public use purposes. This therefore means that if a foreigner purchases a property held under a freehold title, it will revert to a long term leasehold tenure. The restriction also applies to companies that are not wholly owned by citizens or property held in trust whose beneficiary is not a citizen. This note is meant to give a very basic indication of the purchasing process and no liability is assumed as each interested person should seek local professional advice. The London team works closely with our network of local experts in Kenya. Our local agents have been carefully selected for their integrity, experience and professionalism, and speak English. © Knight Frank LLP 2018 – This report is published for general information only and not to be relied upon in any way. Although high standards have been used in the preparation of the information, analysis, views and projections presented in this report, no responsibility or liability whatsoever can be accepted by Knight Frank LLP for any loss or damage resultant from any use of, reliance on or reference to the contents of this document. As a general report, this material does not necessarily represent the view of Knight Frank LLP in relation to particular properties or projects. Reproduction of this report in whole or in part is not allowed without prior written approval of Knight Frank LLP to the form and content within which it appears. Knight Frank LLP is a limited liability partnership registered in England with registered number OC305934. Our registered office is 55 Baker Street, London, W1U 8AN, where you may look at a list of members’ names.